This ANZAC Day marks the 100 year anniversary of the landing at Gallipoli by the Australia & New Zealand Army Corps. This year’s ANZAC Day celebrations are going to be the biggest yet. The enormous amount of time, thought, effort & funding that has been put into preparing for this is mind boggling. 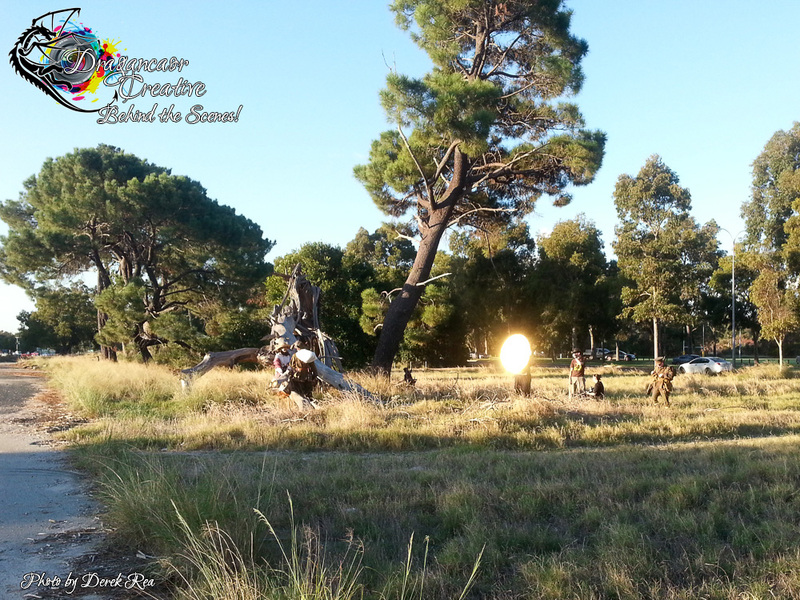 In Perth, there are dawn & dusk services to choose from. Kings Park will be hosting services for the entire week leading up to ANZAC Day. RSL sub-branches will be holding smaller services & parades in the lead up to the 25th April which are perfect for those of you who can’t handle crowds, & people with other commitments on the day itself. There are probably about 3 degrees of separation between most of us & a person who has given their time to service for this country. This year, I am doing more than just attending various services & parades from the 19th-25th April. I want to add to my respect & give my support too. 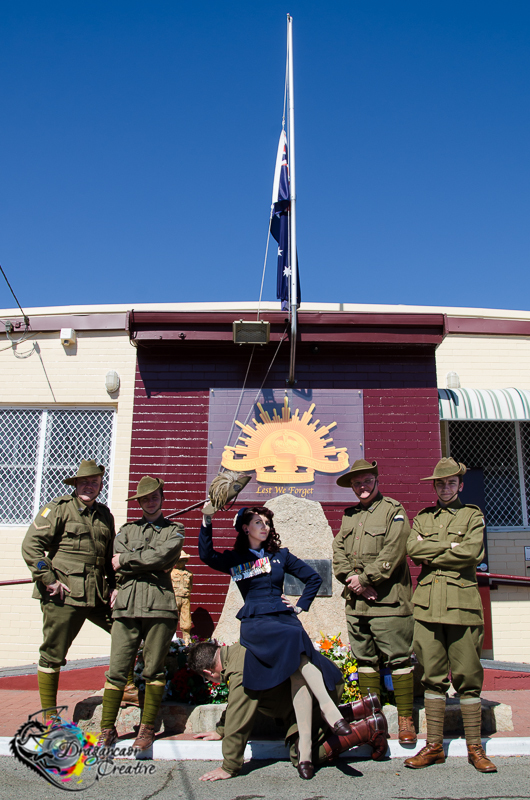 Not only do the RSL preserve the history of those who suffered or died for Australia, but they look after our troops as a support agency. Legacy are a charity who look after the spouses & dependents of deceased Defence personnel. So I’m doing a fundraiser for RSL WA & Legacy. I was present for an ANZAC Day address in 2013, where a Major spoke of how part of the strength our troops take overseas is given to them by their partners & families back home. I thought about it & it resonated. On an active deployment there is both a goodbye & a promise that it isn’t a goodbye. In WW1, we signed up into the unknown. For King, for Country, for our loved ones. A concept I’ve been working on was to depict freshly signed up AIF soldiers saying goodbye to their loves. But I have a tendency for big ideas & anyone will tell you I have perfection tendencies. I knew exactly what I wanted. I could see it all in my mind, it was just a matter of getting it done & having to wait for that perfect weather & light. I spent months scouting locations. I asked a couple of members of the Westralian Great War Living History Association for help, as friends, with getting the details right. When the club itself came to the party, I was blown away. 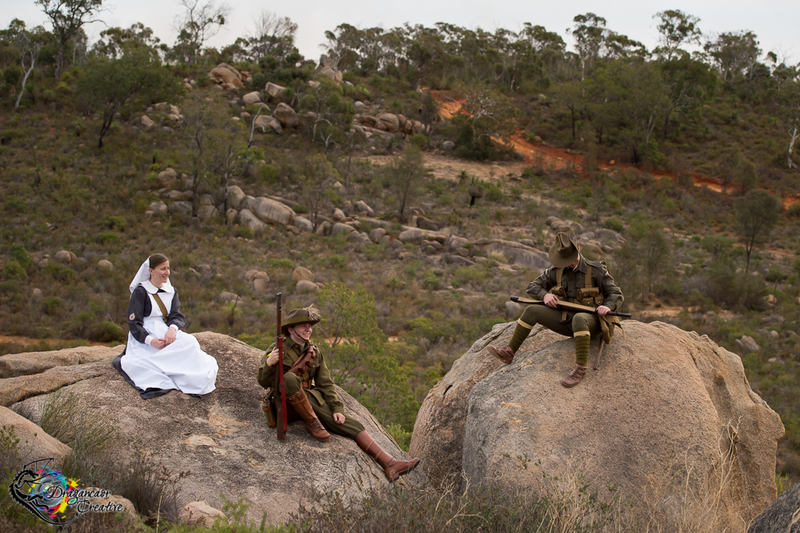 I had four members of WAGWLHA in full kit – 10th Light Horse & 11th Battalion Infantry. There was an Australian Army Nurse’s uniform loaned to us. We had armorers on set for every shoot, as the Lee Enfield .303 rifles were real though fully decommissioned. We also had three people on set who are First Aid qualified at all times (including myself). Behind the scenes, day three. Photo courtesy David Barron. There were lighting assistants, wardrobe stylists, a makeup artist, & a walking assistant (I’m now at 5 ½ weeks of constant headache, double vision, & little to no balance). There were 3 locations, & at least 13 different sets. At one location we had crowd control, keeping people off the set & answering lots of questions. We had 6 people who modelled, & 3 nights of shooting. Looking at the photos straight from the camera, I knew could not have asked for a better cast & crew. What we achieved in each of those short windows of perfect light, is exactly what I had envisioned. One of the final photos, though not one of the Limited Edition images. Money from the sale of all images in the series will be donated to RSL & Legacy, but this photograph wont have a limited run. 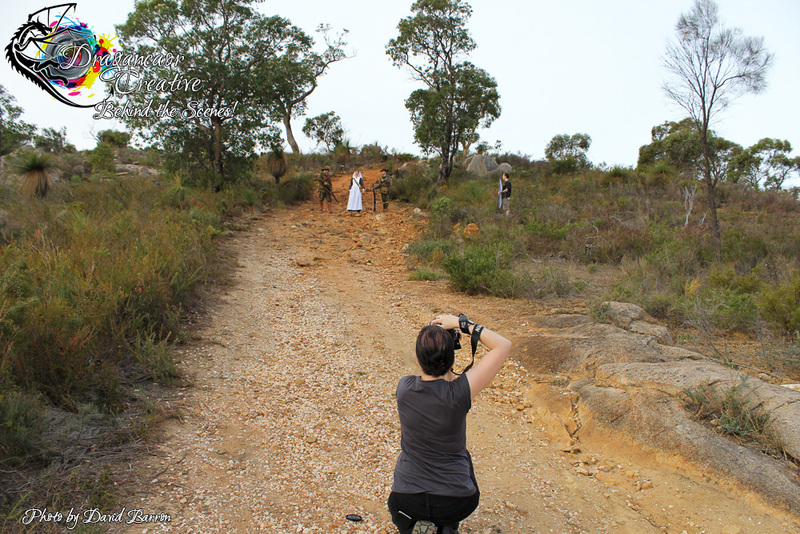 Taken on location in Perth Hills. The pre-order will be opening soon for photographs from this ANZAC History series. Some of these framed prints are to be Limited Edition & will be numbered. Once the extent of those numbers are reached these special images will be retired, so you will want to get in before they’re gone! The money raised from the sale of these photographs will be donated to RSL WA & Legacy, & we have the potential to raise in excess of $25,000 for them through this! The more you share this, the more people you tell, the better the chance we have to reach that target! Or better yet, to smash through it! ← Paul & Nina Get Hitched!